People have different opinions regarding the presence of moles on different parts of their body, some believe it has a special meaning depending on its position while others think it’s just an unpleasant permanent accessory. Either way, there are also different reasons why people opt to do mole removal treatments, like for instance, there are jobs that require a real clear face, or there are beliefs in other cultures that moles on a certain area makes one unlucky. Before we proceed with the removal however, it is first important that we understand what moles are, understand the types of moles, know when it is dangerous and it is a must to have it removed, and suchthen we can proceedwith how they can be removed. Moles are growths on the skin are usually brown or black in color (though some may have a reddish tint). This skin discoloration appears when melanocytes in the skin grow together in cluster instead of spreading all over the skin. Most of our moles will appear before we turn 30, but most of it will appear during our early childhood. Some moles may change in color over time, some may be raised and or flat, others will not change at all while others will slowly fade and disappear, and yet, the one that most of us fear of having, especially on the face, is the one with hair growth in it. Some moles darken with sun exposure while others are affected by hormonal changes during pregnancy. All of us may have seen a spot or two of mole in different parts of our body, and most of these moles are the common moles, or those that are really just caused by the melanocyte collection and they develop after birth. Though relatively safe, some experts believe that if you have more than 50 of these moles, it will still be best to see a dermatologist. Other types of moles are however a little more prone to developing into a melanoma, a type of skin cancer. For instance, the Atypical Mole or the Dysplastic Mole is the type of mole that can look like a melanoma but is actually not. Patients who have this are however more at risk to develop melanoma especially if they have 4 or more of this atypical mole, they already have melanoma, or they have a first degree relative who have melanoma. Atypical moles are usually larger than an eraser attached at the end of a pencil, have an odd shape or is not round, and it has more than one color. They are often seen on the chest and back but can be found anywhere in the body. Melanoma can develop from an atypical mole so people with atypical mole should watch any changes in his or her mole. Another type of mole is the congenital mole or a mole that is present since birth. The size of this type of mole varies and scientists believe that the bigger the size of this mole, the higher the chances of causing melanoma. A congenital mole that is growing may also be a cause of concern so it will be best to have it checked by a dermatologist. The spitz nevus, another type of mole, is also often mistaken as a melanoma due to its pinking color which is also raised and dome-shaped. It may also be found in red, black, or brown color and it typically an opening that oozes. This type of mole can bleed as well. WHEN IS IT NECESSARY TO HAVE A MOLE REMOVED? Some moles have the potential to become skin cancer or melanoma so one should be aware of the changes on their moles. Sudden changes in the shape and size of the mole is one of the things that one should watch with their moles. It may be impossible to note all changes in your moles so it will be best to have a dermatologist have a look at your skin every once in a while. Changes in the mole may signal a developing basal cell, squamous cell, or malignant melanoma. 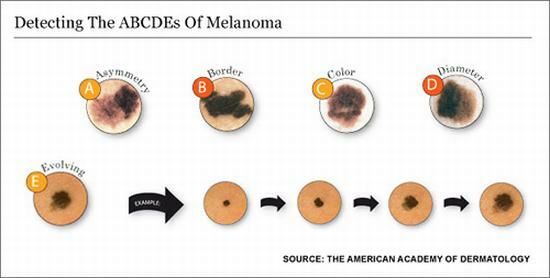 Though basal cell melanoma typically doesn’t spread, it can grow big and and can cause scarring upon removal. Squamous cell and malignant melanoma on the other hand spreads faster even to other parts of the body. People who also have a lot of moles should beware as the greater the number of moles, the more chances of contacting skin cancer so it is a must to be more careful with this. HOW IS MOLE REMOVAL DONE? Mole removal can be done either by laser or by surgery. Removing a mole by laser will be done under topical or local anesthesia. The laser will then be passed through the mole to remove the pigmentation. A scab will usually form in the area in a matter of 7 days but the chance of visible scarring is very minimal. Patients who had done laser treatments should avoid sun exposure especially on the area for at least 1 week. For the surgical excision, this will be best for deep moles because laser may not be able to go deep enough to fully remove the pigmentation. Excision may be done by cutting or cauterization but these methods may leave a scar. Usually, for moles that are high risk for melanoma, surgical excision is the treatment of choice. WHY SHOULD YOU DO MOLE REMOVAL AT YOSKARN CLINIC? Since there are different types of moles, there will also be different ways of treating them and at Yoskarn Clinic, we always provide patients with options so we have almost all the available treatments that the cosmetic industry can have. We also do surgical excision of moles and since our surgeon is a cosmetic and plastic surgeon, you can rest assured that the scar will be as aesthetically pleasing as possible. Aside from this, we also provide hotel assistance to our patients as we are affiliated with Aphrodite Inn, the hotel just beside our clinic, and our patients can stay in this hotel during their stay in Bangkok. The hotel is located right at the middle of Bangkok’s shopping district so patients can do their shopping just within walking distance. The hotel also provides transportation and tour packages, along with room service and complimentary breakfast. People have different opinions regarding the presence of moles on different parts of their body, some believe it has a special meaning depending on its position while others think it’s just an unpleasant permanent accessory.